Patio doors in St. Louis should open and close properly to gain easy access to your outdoor spaces. Sticky doors can pose a threat to your home. When you leave them open, elements can enter your home and affect indoor comfort. Hardware issue can cause this type of issue. When looking for new doors, make sure you choose durable hinges and locks. Renewal by Andersen® of St. Louis has a dual hardware option for patio doors. We also have reliable locks for both our sliding and hinged doors. Older doors are more prone to wear and tear. Debris blown in by winds can damage your door, while long exposure to moisture can cause rot. While on the market for St. Louis French doors, look for a material that has high resistance against harsh weather conditions. Our patio doors are made of high-quality wood that comes with either urethane base finish or vinyl sheath. This coating allows for minimal maintenance and durability. Windows are not the only culprits for drafts. Gaps around doorframes can lead to air leaks or energy loss. Glass type can also contribute to energy efficiency. For your next door replacement, make sure you work with experts like Renewal by Andersen to ensure professional installation. Our doors prevent drafts because we make sure they close tightly to the jamb. They also contribute to energy savings because they come with High-Performance™ Low-E4® SmartSun™ glass. This is our most energy-efficient glass option available. 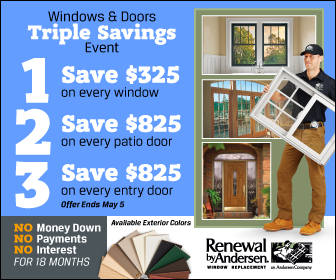 Renewal by Andersen of St. Louis has the solution for old, worn-out, and inefficient patio doors. We offer contemporary and traditional designs as well as customization options. Call us today at (314) 332-2364 to learn more about our patio doors. You can also schedule a free in-home consultation when you fill out our contact form.